It appears, from the accumulation of results that I gleaned from Facebook, Flickr and the comments here, that the verdict on yesterday’s images is split fairly evenly between first and second photos (the one that is overall crisper and the one where the house in the background is sort of blurry). Some folks preferred more depth of field, some liked less. It was also interesting to see that the reasons that each group gave for preferring one or the other of the shots were also things that occurred to me about each photo. Today’s shot was also taken yesterday, in Bay Roberts, along the seawall on the north side of the harbour. I shot it in colour, but switched it to black & white (my camera only shoots in colour) after. I also applied a red filter, to bring out the detail a little. 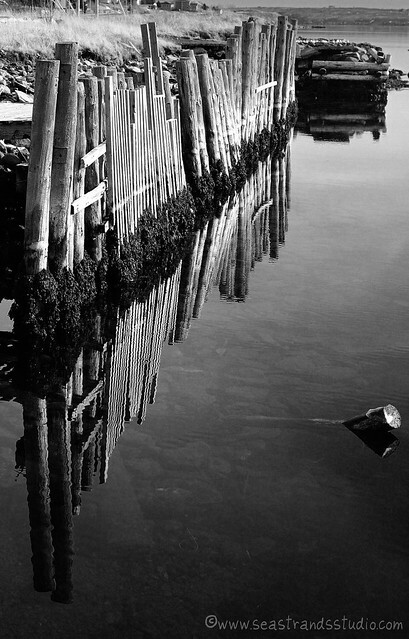 I enjoy being able to see into the water in this shot, a detail that’s lost to the eye when you see it in colour. When colourised, your eye is immediately drawn to the reflection and then carries across the surface. In the black and white version above, the blue barrier of the surface reflecting the sky is gone and the eye is allowed to penetrate to the depths (or shallows, rather) a little. Today is an icky, yucky, miserable old day, full of freezing rain. A perfect day for being inside and getting some work done. Just the other day I accepted a short-term (but fairly vigorous) contract to round up and organize information pertaining to the Craft Council‘s Studio Guide, so I’d best get at it!